Banding nutrients at planting can increase wheat profitability. With more than 13,000 acres in their farming portfolio, Nick and Matt Scharf don’t experience many “firsts.” The steadying hand of experience has assured that these brothers from central Saskatchewan are ready for just about anything markets or Mother Nature want to throw at them. Whether winter or spring, red or white, hard or soft, wheat prices have taken a decidedly downward trend during the past five years. The U.S. Department of Agriculture estimates that average prices have fallen nearly 46%, from $7.60 in 2012 to only $4.11 in 2016. With low commodity prices remaining on the horizon, wheat producers must find new efficiencies in their operations to maintain profitability. That means re-examining every input and management technique. and P and K starter fertilizer placed in the row. Recommendations for starter fertilizer depend on the growing region, soils and type of wheat being planted. However, placing phosphorus in the row approximately 1.5 inches below the seed is an effective practice for all wheat producers, says Gene Breker, new markets specialist with the AGCO-AMITY joint venture in Fargo, North Dakota, manufacturers of seeding equipment like the Sunflower® 9830NT high-speed drill. Needham also encourages growers to place phosphorus in the row when seeding cereals, which can increase phosphorus availability and uptake, especially in cooler no-till soils and those with lower soil phosphorus levels. University of Minnesota research shows that banding phosphorus can reduce application rates up to 50%. “Generally speaking, if you’re in the northern half of the Dakotas and all of Canada, you can put nitrogen down when planting winter wheat,” says Breker, adding that a band placed 3 inches to the side and 1.5 inches deeper than the seed planted in 6- to 8-inch rows is highly effective. 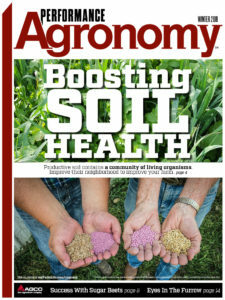 “Those planting spring wheat also can apply nitrogen at seeding time because it doesn’t have time to leach before active plant uptake occurs,” he says. 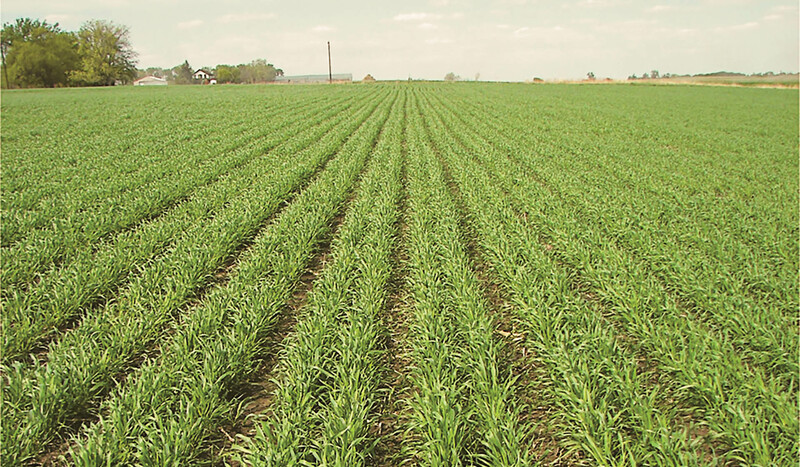 For most winter wheat across the country, Needham normally advises producers to split their nitrogen application, fertilizing at green-up and again at jointing to early stem elongation. In spring wheat, he suggests putting a portion of nitrogen down at seeding time and returning back around early stem elongation with the balance. Needham recommends using a crop-sensing system to allow the second application to be applied variably. Both Breker and Needham agree investments in soil tests will more than pay for themselves by helping producers gauge nutrient needs and avoid unnecessary fertilization. Back in Perdue, Nick Scharf is putting recent soil test results to use. After spurning wheat in 2016, he and his brother planted 1,000 acres of the grain this spring, applying starter fertilizer in bands. He used his mid-row bander to place both phosphorus and split-rate nitrogen roughly 3 inches deep where the crop’s roots could easily intercept it.